Maimi makes an announcement about the future of Hello! Project and her part in it in her October 8th update “Important announcement “. Full translation below. I, ℃-ute’s Yajima Maimi, will become the new leader of Hello! Project. As expected, I can feel the weight of the responsibility of being the leader of Hello! Project while it goes through these big changes! During times when we’ve been worried and confused, Saki and I have cooperated as both the captain and leader of our groups and as contemporaries. I hope the 2 of us can unify Hello! Project together until next spring! “Let’s work hard together “, and it’s really reassuring! 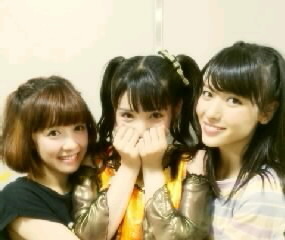 And then, I want to treasure my remaining time together with Michishige-san and learn from her how to be the leader. Everyone, please continue to warmly watch over Hello! Project and passionately cheer for us! Posted on October 26, 2014, in Blog, Translations and tagged Yajima Maimi. Bookmark the permalink. 1 Comment.